There are several ways to set up an irrigation system depending on the type of gardening you are doing. When used with a timer this is absolutely the best way to water your plants. 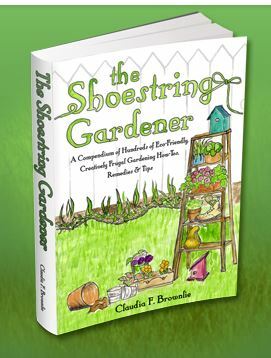 No more forgetting to water or forgetting to turn the hose off when you are watering. Just a nice even daily (or every 2 or 3 days) watering. Inconsistent watering is one of the main causes of blossom end rot in tomatoes and causes multiple issues with any plant. If your plant is too dry it will wilt and possibly die. If it is too wet you can drown it. When properly set up an irrigation will yield up to an 75% – 80% water savings. Irrigation systems are usually used with pressure regulators to lower the pressure of the water in a system. A direct water line will usually have too much pressure for these types of systems. Drip irrigation is used when you are doing container gardening. This is the type of irrigation system that we used to use on our front porch. We had both hanging baskets and pots set around the edge of the porch. There are complete kits available to do this. Typical parts would include distribution tubing, a pressure regulator, a filter screen, an installation tool to make the holes for the emitters and stakes, end plugs to close off the end of the tubing and a few other parts. You are able to adjust these so that you have an emitter in each pot that you need to water. This kit pictured even comes with a timer. This is what we use in our garden. In fact the picture at the top of the article with red plastic mulch is my personal garden. We have been doing pretty much the same setup for about 20 years now. It works well for us. This can be used in raised garden beds or standard gardens. We garden in 4′ wide raised garden beds. We plant our seeds and seedlings in 1′ from each edge. We have 2 rows of drip tape in the 4′ wide area, spaced at about 1′ 6″ in from the edge. We put our drip irrigation system down and then we cover it with plastic garden mulch. Then we plant our seeds or seedlings. We have ours on a timer set for 15 minutes every other day. With the water savings from the drip irrigation and the moisture retention from the mulch, we really do not use much water. Even in our summer heat of 100 degree days we do not change from the 15 minutes every other day. There are drip irrigation kits available. They will have the drip tape which has holes predrilled and all of the fittings you need. A pressure regulator should be used with this system as well. Don’t forget the timer! These don’t usually come in the kits. You simply lay your tape out and staple it down with included ground staples, put all of your fittings together and you are ready to water. They even have goof plugs in case you poke a hole in your tape by mistake. Trust me, it happens occasionally. Oops. For all of you who like a d-i-y project, this one is simple enough to make. 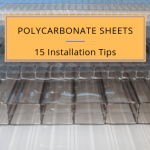 You should use schedule 40 PVC pipe 3/4″ in diameter. Drill 1/16″ holes in the appropriate spacing for your plants. You can place this with the holes up or down depending on your preference. Also, if you have a small area you want to do a heavier watering you can drill holes opposite each other. Lay the pipe so that these are pointing out. You will get quite a bit of coverage from this method. If you are doing smaller plants that are spaced closer together you can drill your holes about every 6″. For larger plants like tomatoes you should have holes where the plants are at and an extra 2 – 3 holes in between. I only plant my tomatoes at 3′ apart. I would just do one hole in the center of the plants and one at each plant. I know other people will space their tomatoes as far as 4′ or 5′ apart. For this you would want the 2 – 3 holes in between. You want to make sure that your garden surface is level so that the water will flow. You can lay these out in pretty much any configuration that you want, but you should have ball valves so you can shut off sections or rows. In addition you will need fittings such as t’s, elbows, end caps, pipe cement etc. This is perfect if you have a greenhouse or have your plants spaced closely together. The spray heads are adjustable from a light to a heavier spray. This system even comes with a timer! 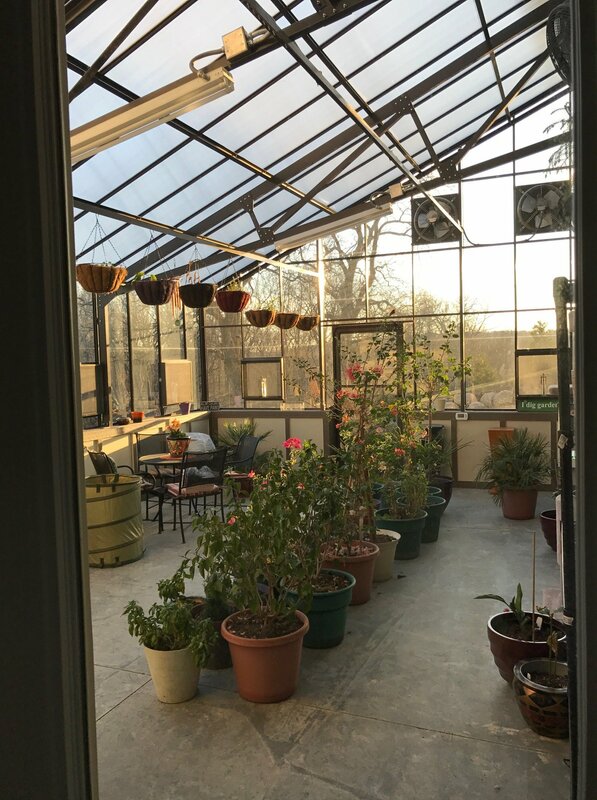 I have always had a similar system in my personal greenhouses. The picture above is from my Halls Magnum that I used to own. Unfortunately it got left in a move. I loved that greenhouse! 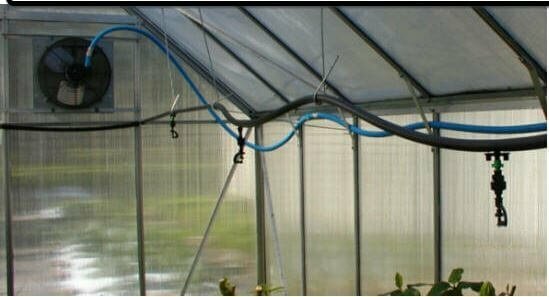 It is tubing hanging from the top of the greenhouse with spray heads at appropriate spacing. You can see it at the top of the sidewall. The blue is a flexible conduit with wiring for the ventilation system. Again, a time and plant saver. In conclusion, I would not even attempt to garden without an automatic watering system. As busy as we all are it is just too easy to forget, even though we spend hours in our gardens. Plus, the plants seem to really thrive with a consistent watering schedule. And that is really what it is all about – healthy, high yielding plants. I admit it. I do not do well during the short, dark, cold days of winter. I so look forward to the spring every year. That’s why seed starting day is a day I relish in. To me it is the first sign that spring is just around the corner. The dark days of winter will soon be gone. Here is the way we start our seeds. Seeds, soil, a shallow tray or bucket to moisten your soil. a tray to place your plants in, a propagation mat, jiffy pots, plant stakes and a permanent marker, vented humidity dome, and a lamp if you are starting indoors. 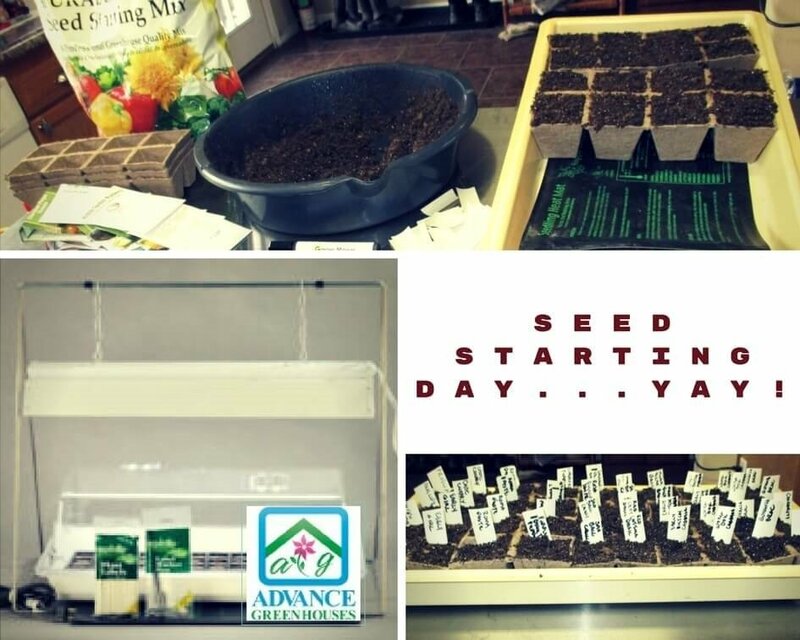 Seeds – should be for this year, although I store my seeds in the refrigerator in a baggie, and I have used seeds as old as 10 years and gotten germination (sprouting). Of course the germination rate may not be as high as with fresh seeds, but I don’t like to throw anything away. I just plant extra seeds when planting. You should also make sure that you are planting the proper seeds for the time of year. Soil- I use a good grade of potting soil. The one I have been using for the past couple of years is a natural and organic seed starting mix. You will need a bucket to work the soil with some water before planting. Just make it moist, don’t saturate the soil. If you don’t do this the water will just sit on the top of the soil and not penetrate it at all once you have planted and try to water. Tray – You should have some sort of shallow tray to place your seeds in for watering. Propagation mat – I suppose if one thing on this list would be desirable rather than completely necessary, this would be it. I always use a propagation mat under my seeds. 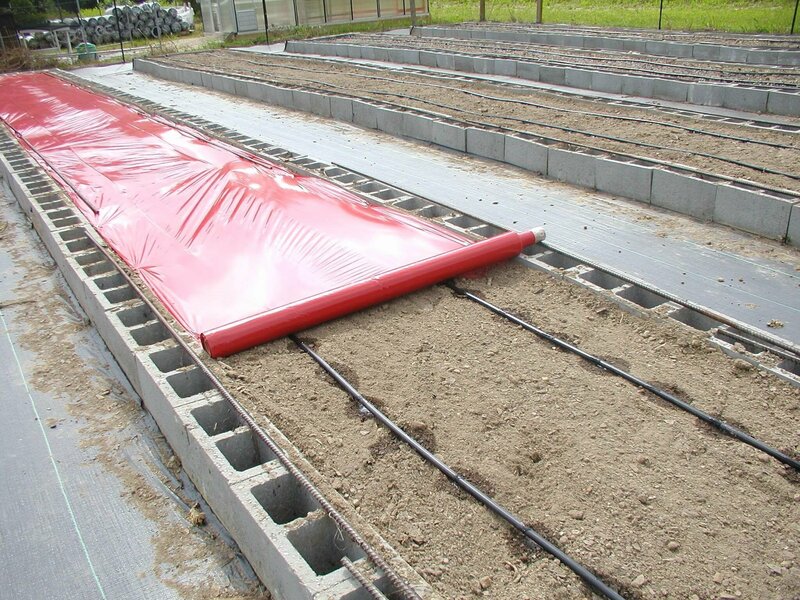 It will warm the soil and assist the germination rate (how many seeds sprout) and also give you healthier seedlings. I put my seed tray on this once it is planted and leave it running until I start to harden off my plants. Jiffy Pots – These are available at just about any garden center. These are made from compressed peat. They are biodegradable, so you plant the entire pot. I remove the bottom of the pot when planting. I usually just throw it in the hole since it is biodegradable. The great part about these is that you are not disturbing your roots when planting. 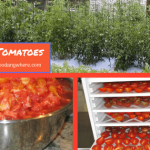 Plant Stakes and a Permanent Marker – There is nothing more frustrating than planting a seed, watching it grow, picking your vegetables and saying “What variety of tomato is this? I would really like to plant it again.” Be sure to mark your plants and be sure to use a permanent marker. 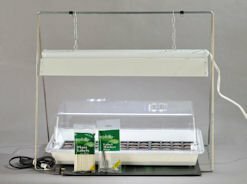 Vented Humidity Dome – This also assists in the germination of the seeds. It will help to keep the humidity higher. This can be removed once all of the seeds have germinated. Lamp or Lighting – We use fluorescent lighting with wide spectrum lamps. They don’t produce any heat, so they can be close to your seedlings without damaging them. 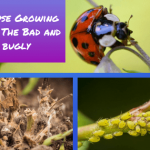 As a rule of thumb these should be placed 2 – 6″ above your plants. You can start out as low as an inch. Monitor your plants to make sure they are not getting burned. If you find they are too warm, move your lamps up slightly. This is where a stand with an adjustable height is really nice. Also, as your plants grow, you are going to want to be able to raise your lights to meet the height of the plants. 2. Make sure that all of your items are clean and ready to use. If you are reusing soil, it should be sterilized before use. For the homeowner, most will start with new soil. You will probably be reusing some of the items such as your tray and your bucket. Just make sure that everything is good and clean. This will help to cut down on disease. You may even want to use a really dilute bleach solution to rinse the items before use. 3. Moisten your soil – You should take the amount of soil you think you will need and place it in a clean bucket or container of some type. Mix in water in small amounts until you come up with a crumbly consistency. Place your moistened soil in your jiffy pots up to the rim of the pot. 4. Plant your seeds – I like to place 2 to 3 seeds in each pot. 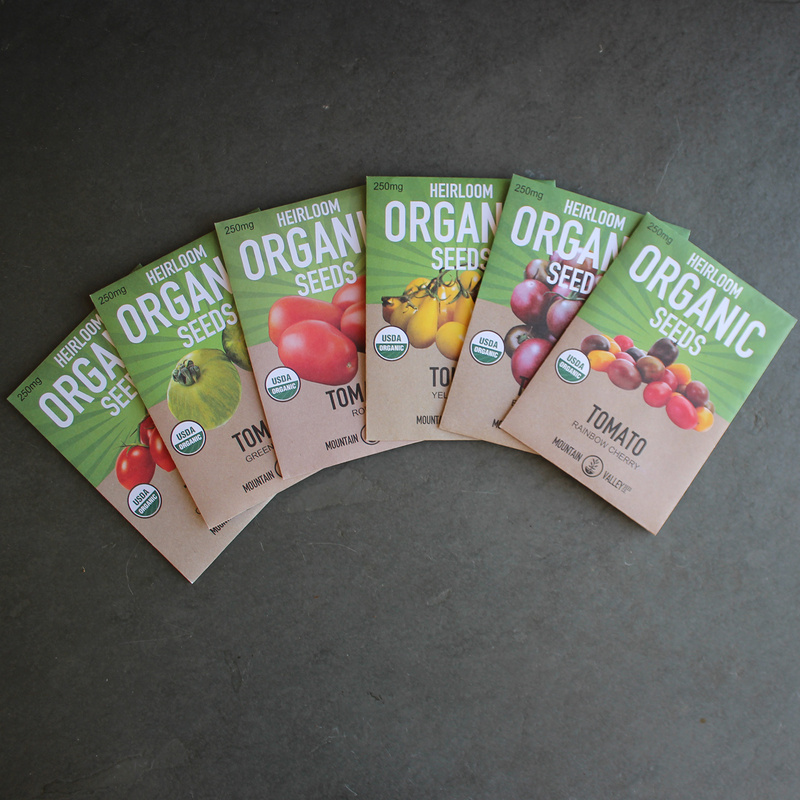 Some recommend only placing one seed per pot. I think that the cost of the seeds is so low that I would rather not take a chance on that being the one seed that will not germinate. 5. Mark your seeds – Do this as you are going, pot by pot. We have not bought any markers for years. We have an old mini blind that we use. We just take the slats apart, clean them good and cut them into marker sizes. There is nothing wrong with recycling here. 6. Place your heat mat in your tray and place your jiffy pots on the heat mat. I use a simple basic heat mat without a thermostat. There are heat mats available with a thermostat if you want to be able to set your heat to a specific temperature. Plug in your mat. 7. Place the humidity dome over the tray. Keep an eye on this. You don’t want to get too damp of conditions. A dome with an adjustable vent is preferred. This will be removed once the seedlings have germinated. 8. Turn on your lights – Now is the time to turn on your lights. I have mine on a timer. I set them to come on at 5 AM and go off at 8PM. Be sure to monitor the height of the lamps as your seedlings grow. Finally, for the best seedlings you should follow these rules. 1. Plant at the proper time. Plant about 6 – 8 weeks before your last frost date. If you are not sure of this you make be able to get a vegetable guide from your local extension office. If you are not sure where your local extension office is just search for extension office, my town. 2. Don’t over or under water your plants. If you are not sure of this, watch your plants. If they start to shrivel, they probably need more water. The soil just be damp to the touch only. I like to water from the bottom. I find that it is gentler on these young plants. I just fill up the bottom of my tray and watch to see that the water is taken up at a reasonable rate. If I see that the water is sitting in the bottom of the tray I will dump it out. 3. Watch your lights. Make sure that you are moving them up with your plants. 4. Harden your seedlings off. Your plants have been inside and not exposed to wind or the harsh sunlight. 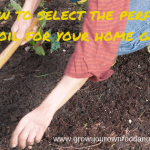 You will want to take the tray outside for about 7 – 10 days before you plant them. Place them in a well protected, semi shady location at first for a brief period of time. I start with about an hour. 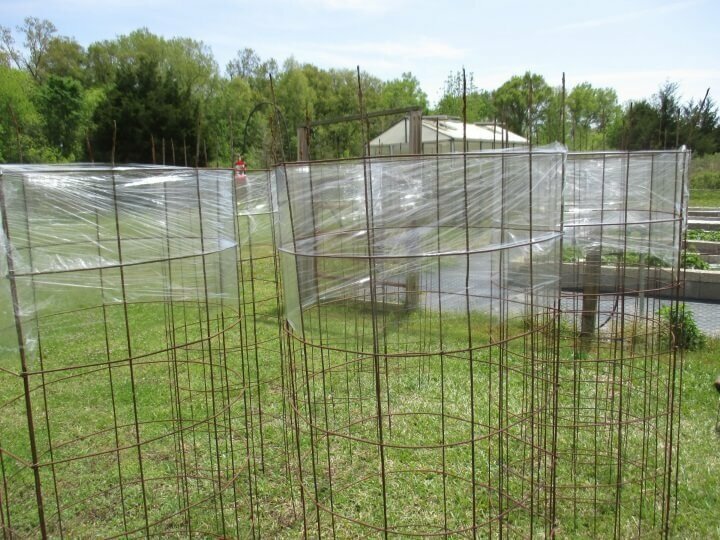 Then, gradually move them to a less protected spot for a longer period of time. This will help strengthen them and get them used to being in a wind. Make sure to keep them watered well at this point. Once you are done with the hardening off, you are ready to plant. 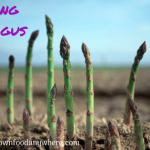 Getting ready to heat your greenhouse? Well, now is the time to either check your existing heater or to purchase a new one. Our top pick, the Southern Burner natural gas or propane greenhouse heater is going to have a price increase (the first time since 2008) on November 20th. So you want to be sure to order prior to that date. 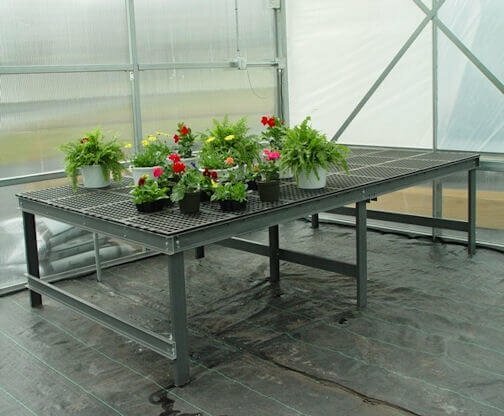 This is a super greenhouse heater that will fit under a bench and not take up any valuable floor space. It requires no electricity. The heater is all aluminum and stainless steel. They will keep the temperature at the top of the greenhouse within about 5 to 7 degrees of the floor heat. There is a vented and a non vented model available. The vented model is 25,000 BTu’s and will be adequate to heat most small hobby greenhouses. 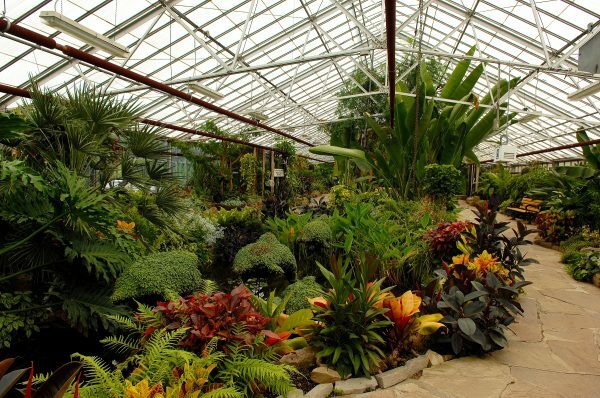 If you have a larger greenhouse you would simply add a heater or two. There is a formula to calculate how many BTu’s will be required to heat your greenhouse based on the size of your hothouse, the glazing type, the indoor and outdoor temperatures. Please be sure to follow this formula, or your heater may be too small to get your greenhouse to the desired indoor temperature. Plan ahead. Winter is headed our way. Don’t be left out in the cold this year! 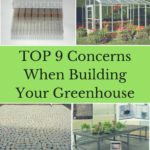 What Tools Do You Need in Your Greenhouse? 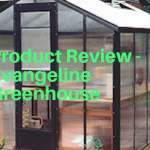 If you are in the process of designing or purchasing a greenhouse you probably have questions about what accessories you should purchase with the greenhouse. I get asked this a lot. 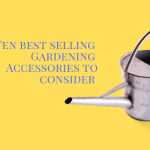 Some people want to completely ignore the accessories, while others have read every article and believe they should buy everything that you can put in a greenhouse. My recommendation is to start with the ventilation package. Yes, you will need it even if you are only overwintering plants and even if you are in a cold location. I have seen sunny winter days when it was 60 degrees outside and my fan and shutters were operating. And, I keep my ventilation system set at 90 degrees. On the other hand, I hate to see people load up on a lot of items that they will never use. A heater is a good idea, if it is close to the time of year you will need it, or if any modifications to the structure are needed to accommodate for vents, etc. I think the rest of the items should be added as needed. Here is a nice article from our friends at Garden and Greenhouse which talks about some small hand tools and re purposed items. These are things probably most of us would never think about, but will be used over and over again. 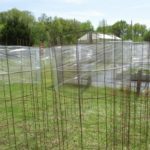 If you already have or are thinking about getting a greenhouse you should consider purchasing several inexpensive tools and related products. 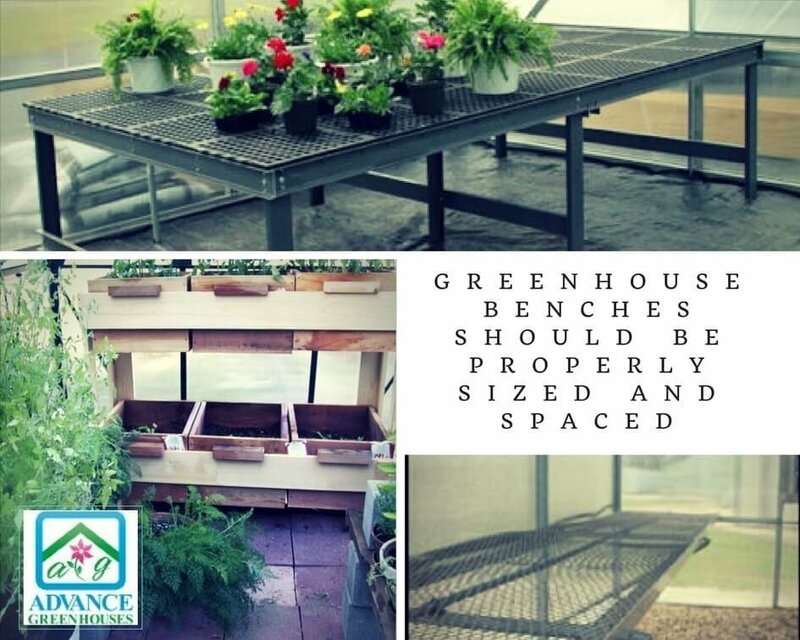 Although the items are not very expensive they can make a difference in how much you enjoy greenhouse gardening and how efficient you are at doing it.